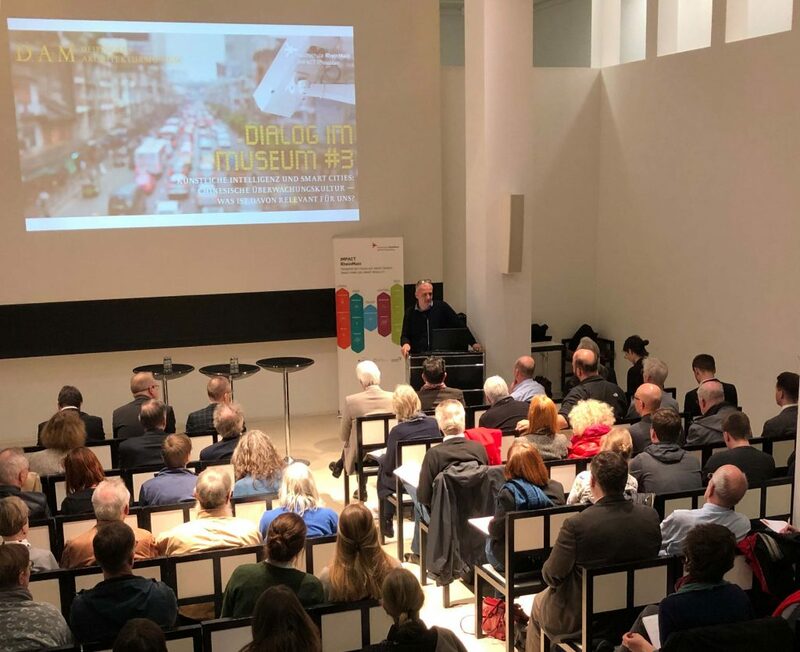 Dialogue in the Museum: "Artificial Intelligence and Smart Cities"
The highlight of the event “Dialogue in the Museum” was definitively the convincing presentation by the studied sinologist and China expert Kai Strittmatter. In his almost 20 years as a China correspondent for the Süddeutsche Zeitung he has gained a profound insight into the quietly and subtly acting centre of power steering world politics. He clears up radically with the superficial perception from afar, that China, ruled by the Communist Party, has long since arrived in the capitalist thought patterns. Far from it: the opposite is the case, according to Strittmatter. The formula “change through trade” did not work out. Following the economic success story of recent decades, Xi Jinping, since 2013 president of the People’s Republic of China, is undergoing a radical “return to a one-man autocracy”. Apart from that, what happens in China has nothing to do with the political ideology of communism the way Marx and Lenin conceived it. Even though the theoretician Karl Marx is often cited in the propaganda speeches. Rather, there is an “elitist capitalism that carries a socialist flag in front of itself,” says Chinese historian Zhang Lifan. Only autocracy was left over from communism. While internal repression is extreme and Xi Jinping “drains all non-orthodox currents” and does not tolerate any criticism, a reinvention of the dictatorship in the era of digitization is taking place. The goal is the “return of totalitarianism in the digital garb”. In his book Die Neuerfinung der Diktatur (engl. The Reinvention of Dictatorship), he cites the German China expert Sebastian Heilmann, who in this context speaks of “digital Leninism”. By 2025, the Communist Party wants to make the country’s economy the world leader in innovative technologies. And by 2030 take the lead in artificial intelligence worldwide. It looks like it could work. For that reason the Communist Party demands checking the “trustworthiness” or better line loyalty of their 1.4 billion habitants. This means total surveillance of public space with cameras and face recognition. Responding to deviations from the prescribed rules means painful sanctions. The social credit system of the rulers is more than discriminating: Behavior is assessed with a certain points system, which leads in the worst case to be registered on a black list (according to a recent ARD report about 12 million Chinese). And that means that these people are deprived of their personal freedom. They no longer have access to mobility (express trains, plane tickets), fast internet, real estate, etc. Artificial intelligence is called the “new electricity” and helps China to optimize its power apparatus. As a force that uses algorithms and digital data to reinvent everything, be it medicine, scientific research, transportation, or living together in cities. It was a pity that, as an antipode to the example of China and the questionable abuse of new technologies as a power tool, the positive side of digital opportunities for improving human living conditions was not being targeted. How to shape digitization so that it contributes to the humanization of the world. The issue of digital humanism and the question of how we can use artificial intelligence and algorithms for the benefit of humans and society, was missing out. China plans to invest around US $ 900 billion in infrastructure projects in Eurasia under the motto “New Silk Road”. These include train lines, ports, airports, roads or even power plants. Those construction will ultimately offer clear benefits for the Chinese economy. More than 68 countries are already involved in the lending and often go through insecure financing resulting in a strong dependence on China. In this context economic and political effects can hardly be separated. The project could also be a central building block in the “geostrategic vision for a new world order determined by China,” comments Strittmatter in his book. “Dialogue in the Museum” is a cooperation project of the Deutsches Architektur Museum and RheinMain University of Applied Sciences. It is part of a larger funding initiative at federal and state level. Two further events are planned in May 2019. The aim of the “IMPACT RheinMain” project of RheinMain University of Applied Sciences is to initiate and implement innovative transfer projects with cooperation partners from business and civil sector with a focus on smart energy, smart home and smart mobility. The € 550 million funding initiative “Innovative University” runs until 2027 and addresses mainly small and medium-sized universities and colleges. KS, Die Neuerfindung der Diktatur, S. 266.